Media Elements did all the website design and development for this website with a very limited budget. A little later the client came back to us to have the site redesigned and built with a more substantial budget to afford a lot of bells and whistles. This site has a semi automated ordering system that makes it easier for the client to organize her orders on a day to day basis. 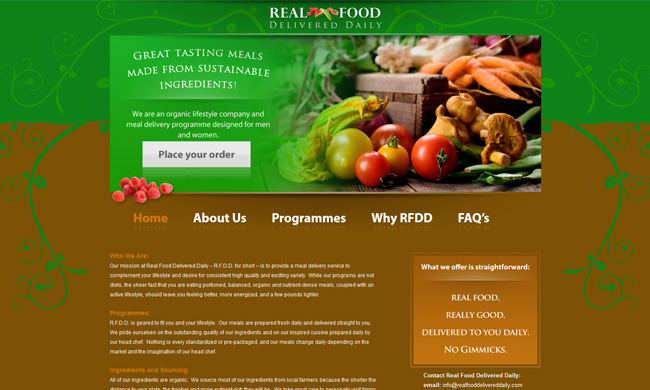 The Real Food Delivered Daily logo was also designed by Media Elements. We feel we accomplished a lot of work in a very short amount of time even with the difficulty of having an international client. Texas born and Los Angeles, California bred, Natalie Brawley is passionate about living a healthy lifestyle, seeking out organic foods and ingredients, and committing to regular exercise – without worrying about dieting. To Natalie, this West Coast lifestyle is second nature to her even though she now lives many miles away. She has been experimenting in the kitchen for 15 years, creating healthy meals for herself and her family, finding alternative yet healthful ways to eat her favorite “junk” foods, and all while maintaining an active lifestyle. This inventiveness in the kitchen, combined with intellectual curiosity about the science of nutrition as well as a love of caring for others, led her to find a way to combine her passions for great food, health, and helping bring the two to others’ lives. She began her career in the health care industry, ultimately combining health and caring for people with haute cuisine via the French Culinary Institute in New York City and as a line chef in two Michelin-starred restaurants in London.